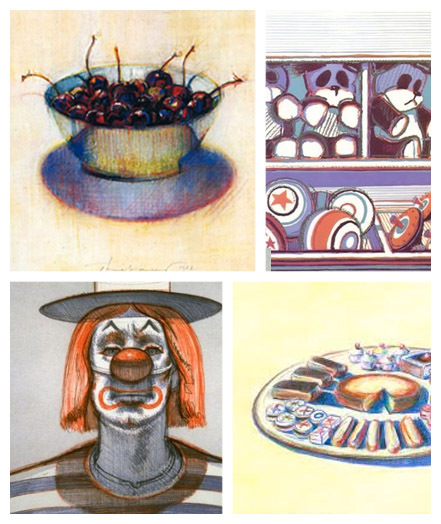 Wayne Thiebaud was born November 15, 1920 he is American Painter who is most famous works are of cakes, pastries, toilets, boots, toys and lipstick’s. He is associated with the Pop art movement because of his interest in works of art in culture, although his works were created during the fifties and sixty’s, slight predate the works of the classic pop artists. Thiebaud uses heavy shadows and exaggerated colors to depict his subjects, and the well-defined shadows characteristic of advertisements are almost always included in his work. He was associated with the pop art painters because of his interest in object of mass culture, his works, are similar to the paintings during the fifties and sixties, which shows the works of the classic pop artists, suggesting that Thiebaud may have had an influence on the movement. Thiebaud uses heavy detail and exaggerated colors to depict his works of art and the well define shadows just like advertisements are almost always included in his work. Thiebaud has painted characters like Mickey Mouse as well as landscapes, streetscapes, and cityscapes, which were influenced by the work of Richard D. His paintings such as Sunset Land (1985) and Flat Land River(1997) are noted for their hyper realism and are in some ways are like Edward Hopper’s work, who was interested with mundane scenes from everyday American life. In his painting, he focuses on the commonplace in a way that shows irony and objective distance from his subjects. He also makes a point of keeping an independent distance from the New York School. Thiebaud considers himself not an artist, but a painter. He is a voracious reader and is known for reading poetry to his students. Thiebaud spoke at Harvard University School of Design in 1990 where he responded to one of the student's questions, "What do you think defines an artist?" and Mr. Thiebaud says. "An artist creates his own world." Wayne Thiebaud is still alive today he is around 93 years old. He has retired from teaching. And lives in San Francisco, California. He won the National Medal of Arts in 1994. He has taught at many schools in California. Did many paintings of food, candy, people, and others. He has made it to a very old age which tells you he is fit. He still lets his art dealers sell pieces of his art. He still paint’s even though he is retired.